Robin Hood chronicles the life of an expert archer, previously interested only in self-preservation, from his service in King Richard’s army against the French. Upon Richard’s death, Robin Longstride (Oscar® winner Russell Crowe) travels to Nottingham, a town suffering from the corruption of a despotic sheriff and crippling taxation, where he falls for the spirited widow Lady Marion (Oscar® winner Cate Blanchett), a woman skeptical of the identity and motivations of this crusader from the forest. Hoping to earn Lady Marion’s hand and salvage the village, Robin assembles a gang whose lethal mercenary skills are matched only by their appetite for life. Together, they begin preying on the indulgent upper class to correct injustices under the sheriff. With their country weakened from decades of war, embattled by the ineffective rule of the new king and vulnerable to insurgencies from within and threats from afar, Robin and his men heed a call to ever greater adventure. This unlikeliest of heroes and his allies set off to protect their country from slipping into bloody civil war and return glory to England once more. DIRECTOR’S NOTEBOOK — A seamless multimedia experience focusing on the director’s vision gives viewers a peek inside Oscar® nominee Ridley Scott’s unique filmmaking process. 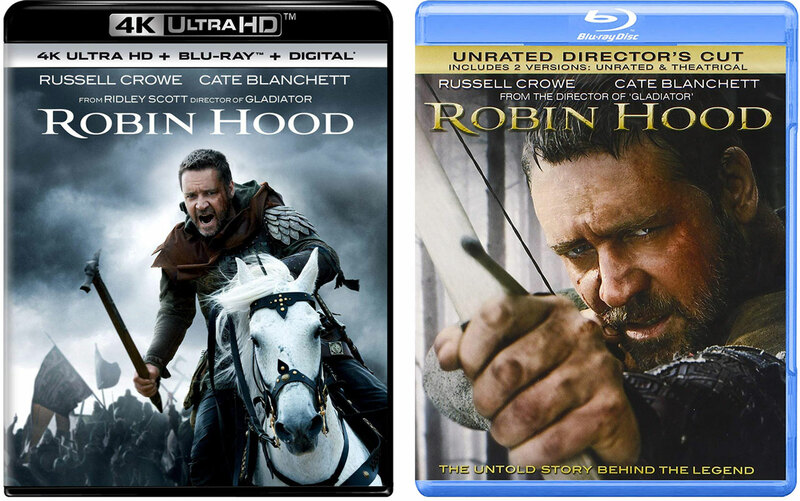 Incorporating behind-the-scenes footage and interviews with Scott and his trusted inner circle of collaborators, this feature launches at critical moments throughout the film to illuminate the task of mounting a vast production like Robin Hood. THE ART OF NOTTINGHAM — A special look at the portfolio of designs generated for the film, including video introductions by key department heads such as production designer Arthur Max and costume designer Janty Yates. Galleries of concept art, costume designs, storyboards and other imagery are featured. BD-LIVE™ — Access the BD-Live™ Center through your Internet-connected player to get even more content, watch the latest trailers and more. MY SCENES — Bookmark your favorite scenes from the movie. Advanced Remote Control: A sleek, elegant new way to operate your Blu-ray™ player. Users can navigate through menus, playback and BD-Live™ functions with ease as well as activate a timeline to skip to any point in the movie with the slide of a finger. Video Timeline: Users can easily bring up the video timeline, allowing them to instantly access any point in the movie. Mobile-To-Go: Users can unlock a selection of bonus content with their Blu-ray™ discs to save to their device or to stream from anywhere there’s a Wi-Fi network, enabling them to enjoy exclusive content on the go, anytime, anywhere. VIRTUAL Keyboard: Enter data into a Blu-ray™ player with your device’s easy and intuitive keyboard to facilitate such Blu-ray™ features as chatting with friends and sending messages. uHEAR — Always catch every word with uHear! This innovative feature instantly skips back a few seconds on your Blu-ray™ disc and turns on the subtitles for the section you couldn’t hear! BALLAD, LEGEND & MYTH: PRE-PRODUCTION — See how the filmmakers and actors, including Ridley Scott, Brian Grazer and Russell Crowe, tackled the challenge of breathing new life into the longest surviving character in the English language, Robin Hood. THE MORE THE MERRIER: PRODUCTION — A stellar cast led by Russell Crowe and Cate Blanchett descended onEngland to shoot this massive epic under the direction of Ridley Scott. With an unparalleled passion for detail, Scott oversees all of the production design, costuming, weaponry and action sequences in the film. NO QUARTER GIVEN: POST PRODUCTION — Sifting through a million feet of shot film, Ridley Scott and editorPietro Scalia perfect the screen story and work with the post-production team to add layers of sound design, visual effects and Marc Streitenfeld’s beautiful score.